Born in 1862 in Middleham, North Yorkshire, James Alexander Gordon Birch was the youngest son of James Alexander Birch and Martha Elizabeth Topham. James’ father died in 1866. He had a sister, Annie, and two stepsisters, Frances and Elizabeth Birch. By the age of eighteen, James Alexander knew he wanted to join the clergy and went to study as a private pupil of Charles R Green, the rector of Rokeby Park. He then trained at Gloucester Theological College and graduated in 1883. He was appointed as a deacon in 1885 and a priest in 1886. James served first as curate of Shirehampton in Gloucestershire from 1885 to 1887 and then of Ripley in Yorkshire from 1887 to 1889. In September 1888 he married Catherine May Hawksley, only daughter of the Rev J D Hawksley, at Arlesey, Bedfordshire. She was born in Clontarf, Ireland, and was two years older than James. James’ next clerical appointment was as vicar of Kirk Hammerton, North Yorkshire, from 1889 to 1902. The couple then moved to Darlington where James became the vicar of St. Hilda’s parish from 1902 to 1915. 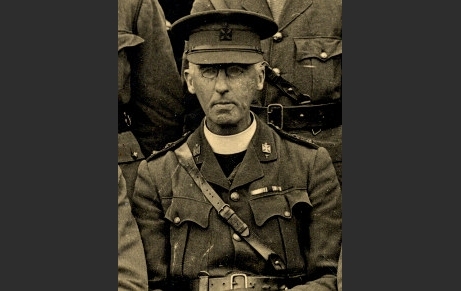 From 1905 to 1923 Rev Birch also served as a chaplain to the Territorial Army. He was chaplain to the 1st Volunteer Battalion, The Durham Light Infantry from March 1905 and went to Belgium with its successor, the 5th Battalion DLI, on 17 April 1915. He was 53 years old when he was called on to support 5 DLI through the horrors of the Second Battle of Ypres. James was invalided home with trench fever in August 1915. Reinstated as a Senior Chaplain to the Forces at Southampton on 7 November 1915, he ministered to a military hospital in Southampton and spent the remainder of the war on home service. He was posted to Cannock Chase, Rugeley and Brocton Camps, Staffordshire, on 3 September 1919, and was demobilised at Havant, Hampshire, in 1920. Retaining the rank of Honorary Chaplain to the Forces, James moved to Queen Margaret’s School, Scarborough, in 1920 as the school chaplain. 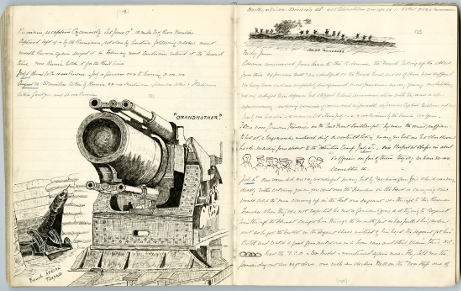 James Birch produced a war diary, in five volumes, covering his own experiences and the conflict as a whole. Each diary/scrapbook is illustrated throughout with watercolour sketches and pen and ink drawings, supplemented by a wide range of printed material. Rev Birch presented his war record to the 5th Battalion DLI and this is now preserved in the regimental archive. ‘I saw 1,000 German prisoners on the West Front, Southampton, big men, the veriest ruffians to look at, a large number unshaved, dirty, discontented looking, many no hats on but close shaven heads, marching four abreast to the Detention Camp’. ‘Six hospital ships in. About 50 officers on five of them, they say we have 30,000 casualties’.